Parameters are the i in BiM. Many Clients and Estate Managers are now interested in using the information contained in parameters for Facilities Management. COBie (Construction Operations Building information exchange) is being touted as the standard format for transferring this data from the Contractor to the Facilities Manager at the end of a project. There is a lot of talk about COBie at the moment but in reality there is very little widespread practical experience even though it is now a requirement by the UK Government as part of the initiatives to move the construction industry over to BIM by 2016. Buildings are becoming increasingly complex to operate. Much of the complexity is driven by technology which is attempting to solve a growing number of complex problems related to the environmental management of buildings. It is not good enough any longer for Facility Managers to receive a load of boxes on the day the building is handed over. Even when the documents are electronic, they are organised in proprietary systems which need to be recoded so that they are standardised. In an attempt to solve some of the issues relating to handover of data, the US Army Corps published the Requirements Definition and Pilot Implementation Standard in 2007 which was one of the first major attempts at standardisation of FM data. At present, COBie is being touted by US and UK vested organisations and agencies as the industry standard for FM data. There is general acceptance that a single standard is beneficial but there will be some pain getting there. COBie has been released as a spreadsheet formatted document in order to increase the penetration in the marketplace. The spreadsheet is straightforward to follow as it includes a series of sheets or tabs which are listed on my previous post on COBie. The UK Government require COBie data to be handed over in a series of data drops throughout the design and construction phases of the project rather than in one foul swoop sometime around project handover. There is still a lot of confusion as to when the data drops actually happen and to whom they should be delivered to. In the UK, the recently published PAS 1192-2 by British Standards defines a process and a set of roles which goes some way to structuring how it will work but as yet there is very few practical examples. Some organisations such as universities, defense forces and healthcare facilities already have reasonably well defined systems for organising FM data which does not fit with COBie and may not want to change. Yet the UK Government will require the data in COBie 2.4 in order to meet criteria for public funding. There will be some duplication but Revit and the COBie toolkit can help reduce the duplication to a minimum. Anyway, back to parameters. Completing COBie spreadsheets is not very productive as much of the data already exists in the Revit model. Revit already has spreadsheets, so the data in Revit must be collated and formatted into the COBie format. 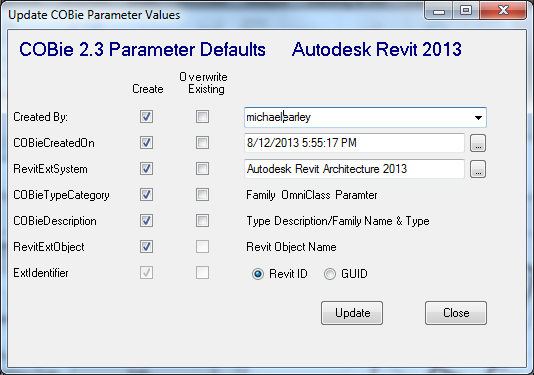 Autodesk released a Revit add-in which will help create the parameters and COBie schedules. You could create these manually from the COBie Guide but this could take some time. The COBie add-in for Revit basically automates the process. The COBie toolkit can be implemented in 2 ways, either by using the Project Template located at C:\Program Files (x86)\COBieV2_30UtilitiesforRevit2013x64\Template or by following steps in the Revit COBie Toolkit documentation provided to implement it on an existing project or project template. I would suggest adding it to a single or test project first before diving in and adding it to your templates. 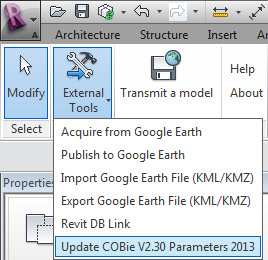 Note: The location to the template assumes the 64 bit version of the COBie toolkit for Revit 2013 is installed. The path name will differ slightly for 32 bit and previous versions. As of 17th August 2013, the toolkit for Revit 2014 is not yet released. You can always upgrade a Revit 2013 template or project with COBie fields for now until the 2014 version is released. Once you have followed the instructions for adding the toolkit to your project, the COBie Schedules are added to the list of schedules for the model. Each COBie schedule begins with COBie2. Note: Not all COBie schedules will be added as some schedules do not relate to anything that can be scheduled from Revit e.g. Contacts. Objects that are scheduled in COBie contain a number of parameters prefixed by the letters COBie under the Other group. The parameters can be accessed by selecting Project Parameters from the Manage tab. All the parameters are shared parameters which are stored in a text file located at C:\Program Files(x86)\CobieV2_30UtilitiesforRevit2013x64 if you have installed the 64bit version of Revit 2013. The COBie Add-in update will be available under External Tools on the Add-ins tab. The only function of this update feature is to apply values automatically from values such as CreatedBy which you can type in or object values. You can run this update tool at any time, but it must be run prior to finalising the schedules. Tick the Overwrite Existing boxes if you are running it for the second time and want to update the values for all fields. The COBie2-Component-Door schedule should look something like the schedule below. This great, the headings match the component schedule in COBie 2.4 and a number of the fields have already been completed saving time. 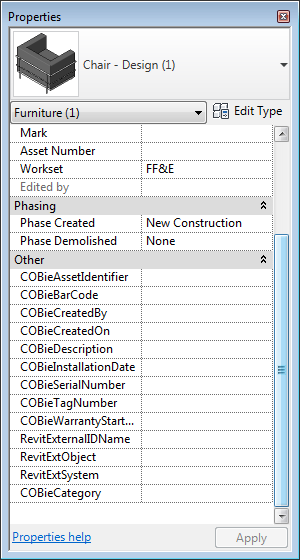 COBie schedules require mandatory fields to be available in the schedule but the parameter that provides the data does not have to be one of the parameters provided by the Revit COBie toolkit. You can select one of your existing parameters as a field for the schedule and change the field heading under Formatting to suit. COBie spreadsheets are starting to become mandatory deliverables for projects. The COBie toolkit reduces the grunt work associated with producing COBie spreadsheets. Don't be afraid to replace appropiate fields which you have already used perhaps as part of the Asset Management strategy for your client in the COBie fields as there is no reward for duplication of data or effort. Just simply rename the field heading in the COBie schedule. The COBie Guide is the result of man-years of effort in the development and testing the use of COBie on real projects. Do you have any idea how to accomplish the parameter update now that the 2015 version of Revit doesn't include that functionality? - Không biết tam quan là những cửa gì? Cửa thứ nhất là Nhân Giá Quan, cửa này khảo nghiệm đạo tâm của ngươi. Cửa thứ hai là Địa Chi Quan, khảo nghiệm bản lãnh của ngươi. Cửa thứ ba là Thiên Chi Quan, khảo nghiệm ý cảnh của ngươi! Chỉ có qua được ba cửa này thì ngươi mới có đủ tư cách trở thành đệ tử của Thiên Vận Tông! Ngươi có dám không? Thanh âm kia trước sau vẫn bình thản, từ từ truyền đến, không có một chút nóng giận. Tiếng nói vừa dứt, hàng vạn đạo tinh quang từ hư không bốn phía lập tức lóe ra, nhanh chóng ngưng kết với nhau thành một vòng sáng hình bầu dục. Vòng sáng này bay trước người Vương Lâm. - Có gì không dám! Nói xong, hắn bước về phía trước, trực tiếp bước vào bên trong vòng sáng.